TORONTO, September 13, 2018 – Pink Lloyd, Canada’s reigning Horse of the Year, will be among the numerous stars in the spotlight over Woodbine Mile weekend as he headlines a full field of sprinters set to run in the $125,000 Bold Venture Stakes (Grade 3) featured on Saturday’s undercard. Trained by Hall of Famer Robert Tiller for Entourage Stable, the six-year-old millionaire son of Old Forester will be aiming for his fourth graded stakes win in the 6-1/2-furlong main track event for horses three years old and up. He has been assessed as the even-money favourite on the morning line. The Bold Venture attracted a field of 10, one of the biggest Pink Lloyd has faced in quite some time with some old and new rivals in the mix. Partnered with Woodbine’s leading jockey Eurico Rosa Da Silva, the top Canadian older male and sprint champion has won five of his six stakes this season following a perfect eight-for-eight campaign in 2017. 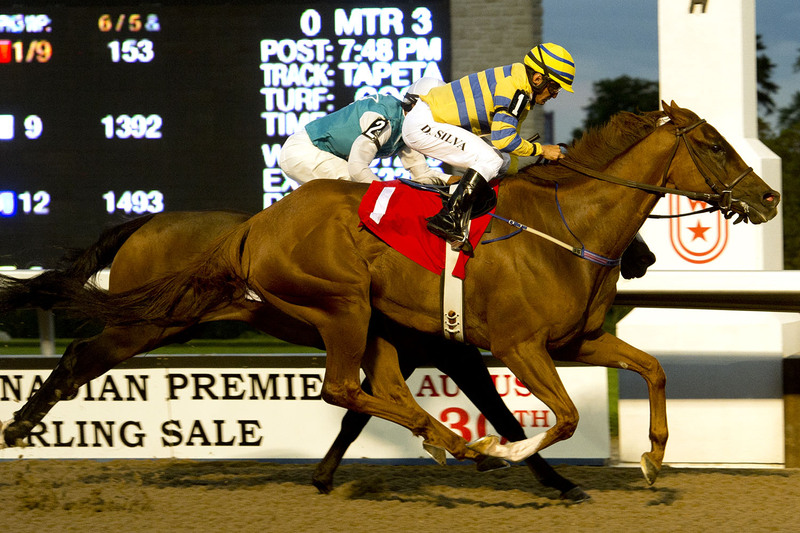 The field includes Goldmart Farms and Royal Laser Racing’s Kingsport, who earned his second Shepperton Stakes title over 6-1/2 furlongs to interrupt Pink Lloyd’s winning ways that subsequently resumed in the Grade 3 Vigil then the OLG Kenora Stakes amid Canadian Yearling Sales Stakes night last time out on August 29. Kingsport also won that night over 1-1/16 miles defeating three-time OLG Elgin Stakes champion Melmich. The Sid Attard trainee had also played the role of giant slayer taking his second Sir Barton Stakes at 1-1/16 miles ending his 2017 campaign over Mr Havercamp, who is a contender in the Grade 1 Ricoh Woodbine Mile on Saturday. Following his Elgin win, the sharp six-year-old son of Milwaukee Brew reverts back to the sprint distance here. Other contenders in the race include defending Bold Venture champion Ikerrin Road and runner-up Boreal Spirit. Owned by Alpine Stable and trained by Vito Armata, Ikerrin Road enters this year’s edition off a six-furlong victory in an allowance race at Woodbine on August 18. A multiple stakes winner in his sophomore season last year, Chiefswood Stable’s homebred Yorkton most recently finished a game second behind Pink Lloyd in the Vigil. Joey Gee Thoroughbreds’ Sweet Little Man has hit the board in his last four starts on the turf for trainer Jim Ensom. Last time out in his stakes debut, the eight-year-old Jazil gelding finished third over seven furlongs of yielding turf in the Grade 2 Play the King won by Mr Havercamp. The field also includes the lightly raced three-year-old Sable Island, newcomer Battle in Seattle, Sweet Grass Creek and Loose On the Town. This entry was posted in Woodbine News and tagged 2018 Ricoh Woodbine Mile Event, Bold Venture Stakes, Horse Racing, Kingsport, Pink Lloyd, Robert Tiller, Sid Attard, Woodbine. Bookmark the permalink.